Are Your Tweets Any Good? Find Out Using "Who Gives A Tweet?" What makes a tweet retweetable? How can you earn more followers? Why aren't people responding to you? These are just a few questions people regularly ask regarding Twitter. While there are many different ways to answer these questions, I believe the solution starts with you. Do you understand what makes a good tweet? Are your tweets any good? In this post, I would like to introduce a free service that solicits the help of your friends and strangers to provide anonymous feedback on your tweets. Are you interested? The service is called "Who Gives A Tweet" and it is a part of a research project involving three graduate students from the University of Southampton, MIT, and Georgia Tech. Kurt Luther, Michael Bernstein, and Paul Andre' launched the site "to understand what aspects of Twitter content are considered valuable, and how that impacts presentation and perception of online identity." Stated another way, the guys want to know what makes a good tweet and how it affects YOU on Twitter. 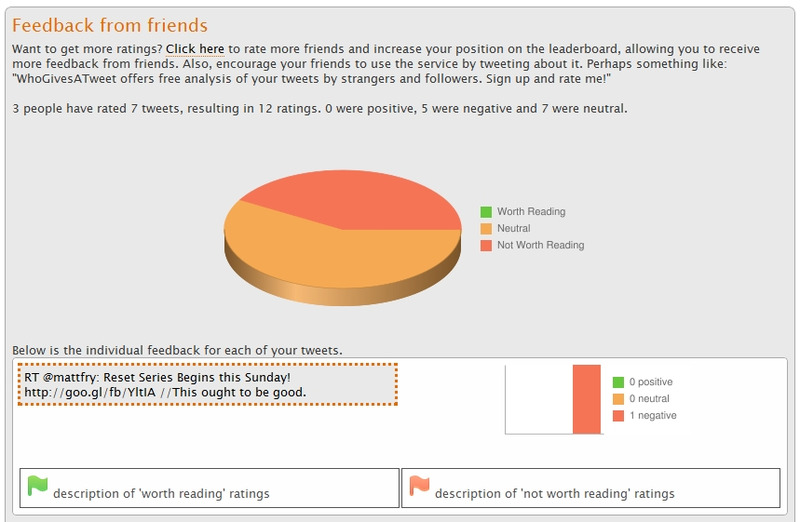 The core function of the project is rating tweets. 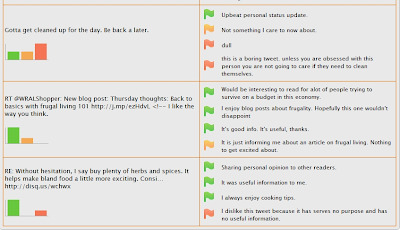 As shown in the image below, users receive a combination of 15 tweets from Twitter friends and strangers. The grading scale is made up of three options: Not worth reading, Ok, and Worth Reading. For each answer, you are encouraged to provide additional comments explaining the reason you gave it that specific grade. Note: Feel free to share your honest opinion as the answers are completely anonymous. Once you finish grading 15 tweets, you will be redirected to a page that displays what others think about your contributions. 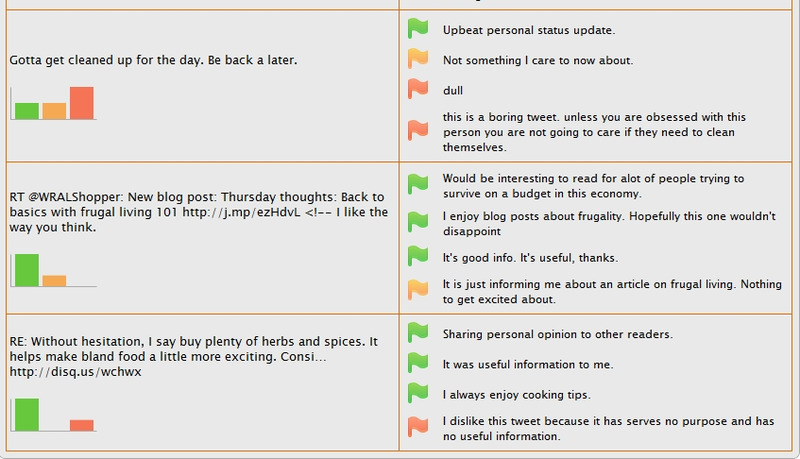 The first section displays what a stranger thinks and the second area shows you what your friends think. Note: I'm not sure what algorithm the researchers are using, but the more you rate others, the more often your tweets are graded. 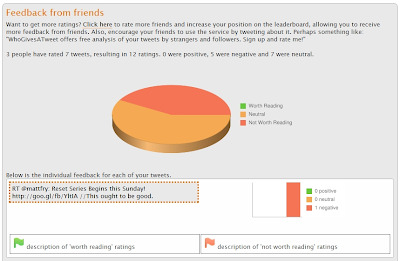 As a result, it is beneficial for you and your friends to rate more than just 15 tweets. 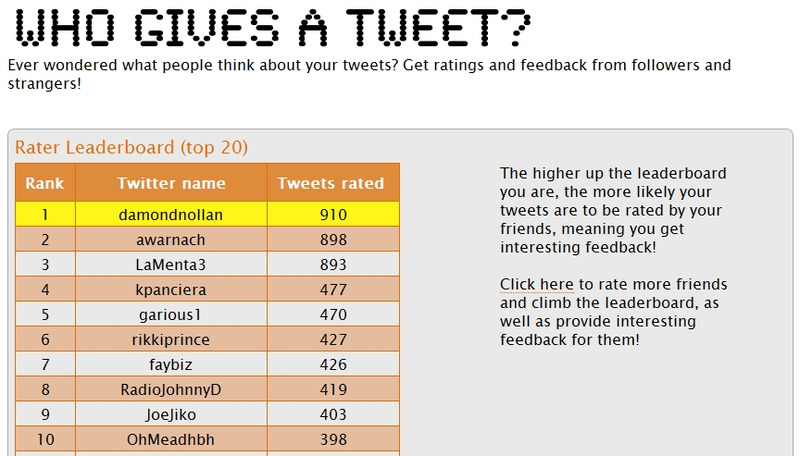 Tweets with quotes, jokes, and interesting observations get higher ratings. It was rare that I gave any tweet that posted a quote, joke, or observation a not worth reading. At worst, I gave it an OK, but it often did really well. Automated tweets get ignored. How many times have I shared my location with people using Foursquare? The answer is a lot. Unfortunately, when other people do it, I tend to ignore the tweet as not worth reading. It's not just Foursquare, but it includes automated tweets from games, sites you frequent, and contests you joined. I like tweets with links. People that share good information often enclose a link as well. A good example is @chrisbrogan where he sets up a link with an awesome intro. Chris writes, "This is why you should follow @MargieClayman - http://ow.ly/3wpvQ" While I don't know Margie, I'm interested to find out why she is worth the follow. Ask questions. I find that tweets with questions are more engaging than those that just state a comment. Those questions with a link attached lead me to believe there is a possible answer involved. Assuming I like the question, I tend to follow the link as well. No fragments, please! There are many tweets that I rated poorly simply because it lacked context. These tweets were not addressed to any one person, but rather stated as a stand alone announcement. My advice is to write a tweet like you would write a complete sentence. I don't like to be sold. I know Twitter is the breeding ground for marketers and all, but it gets old, fast. Try listening to my problem first before you bombard my Twitter feed with spammy solutions I don't need or want. It's all relative. Not everyone agreed on what was a great tweet. Often times, it just depends on who the reader is. I shared one tweet about an upcoming sermon series at church. Some had no interest at all, but others found it to be the contrary. In the end, you just have to be you and do what fits your personally. Think about how you are adding value. Ultimately, this is the biggest lesson of all. 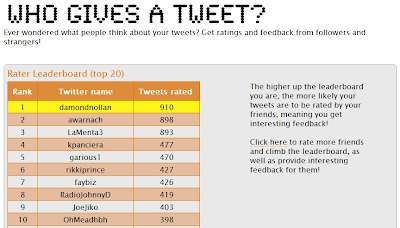 After reviewing nearly 1,000 tweets, I realized my favorite tweets were the ones where they created value. Before this exercise, I would shoot off a tweet giving it nearly no thought at all. Today, I am learning to think like my followers. What can I convey or share that would be of value to those who read it. Telling you what I had for lunch does little to help others. However, sharing a link to an interesting article, with my personal thoughts, is on the right track. What makes a tweet retweetable? How can you earn more followers? Why aren't people responding to you? These are answers that you can answer once you have taken the time to examine the tweets you like and dislike. Additionally, encouraging your friends to participate and share their anonymous feedback on your tweets will do wonders to help you understand which tweets bring the most value. Once you've given it a try, why not share with me your own observations? What did you learn? What would you change? Let me know in the comment section below.